Holiday specials–donating for meals, getting ready to sing, and looking forward to a Repair Cafe? We’ve been collecting non-perishable food items, destined to be part of the 6 “holiday meal kits” we will be donating to 6 needy families. The Washington County Head-Start office is working with us, as they did last year, and will direct the food boxes to deserving families with children. How can you help? We’re looking for things that will make a special meal that will bring some holiday good feelings to folks that need it. Think about items that will bring smiles to the parents and the kids. Here are a few ideas, please add your own! We’ve already gotten financial donations from patrons of “Kids Trade ‘n’ Play”, (our once-a-month clothing exchange which happens on the 2nd Saturday of each month), which have let us purchase 6 good-sized turkeys to include. 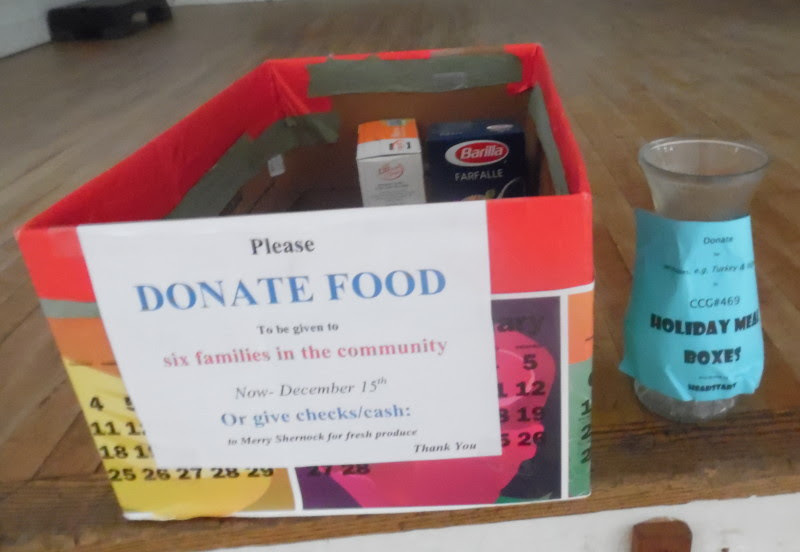 We had a family from Berlin rent the Grange Hall for their extended-family Thanksgiving dinner–and they collected $125.00 more, which will help us by fruit, vegetables and other perishable items. So think of other special things that will delight the palate, sweeten the celebrations, and warm up the hearts of people just like us, who need a little extra help. Drop ’em in the boxes around the Hall, and we’ll make sure that they get to the right homes, by Dec. 20th. Mat Nunnelly, our excellent Grange Musician, will accompany songs on the piano. We’re working on printing up some song sheets for some of Mat’s favorites–and we want to hear yours! We will do our best to sing along with any seasonal songs you bring, from sacred songs of any tradition to less-than-sacred ditties about the demise of elderly relatives at the hands (or hooves) of seasonal ungulates. We are non-denominational and non-partisan, we just like to sing! Join us from 4:00 to 6:00 PM. We’ll provide some mulled cider–please bring some goodies to share if you can. We’ll also provide some crafts for little ones downstairs–or they can join in the singing! Wanna pitch in? Join Erin & the volunteers on Friday to plan the future! Nearing the 3rd anniversary of this very successful community service tradition (we can certainly start to call it that! ), organizer Erin Barry reported at our Dec. 1 Grange Meeting that it’s busier than ever. 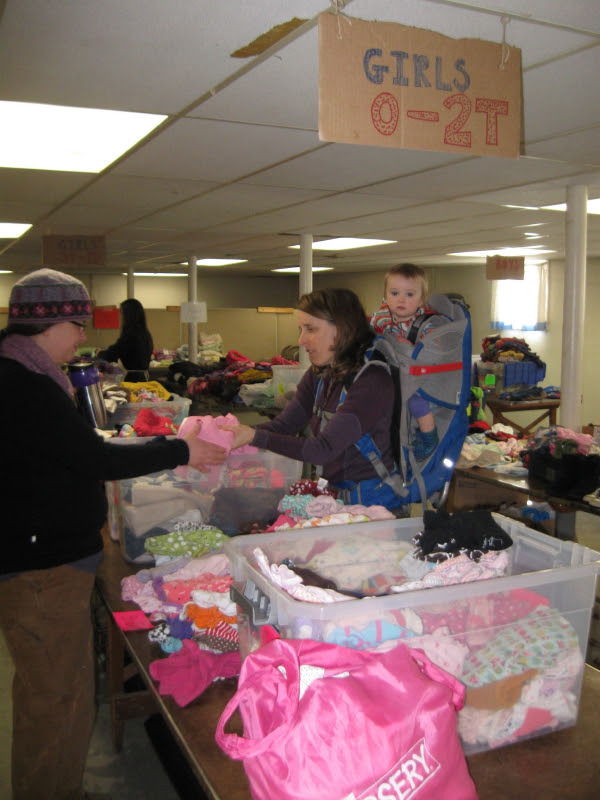 In November, about 80 adults and 50 kids showed up, to donate out-grown, gently used kids’ clothing and toys, and to get “new” ones in bigger sizes. 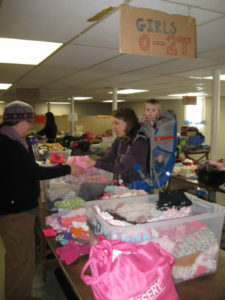 Erin has a number of dedicated volunteers who help to organize the donated clothes, toys and kids’ gear. Before the 2nd Saturday morning events, all of the items are set out on the cafeteria tables, sorted by sizes in plastic tubs; donations are sorted as they come in, and then it all has to be put away again afterward, on the shelves that the Grange purchased. The clothing exchange has turned into a real meeting place for parents & children–which is just what Erin wants to foster. Besides the clothers, connections are made, information is shared, kids and parents bond with each other. To keep the good things going, Erin and some of the core volunteers will be meeting (along with doing set-up for the Saturday KTNP) on Friday evening, from about 6:15 to 9:00 PM to discuss how to grow the operation and share the work, while maintaining the personal connections. Want to join the volunteers? Come on by on Friday evening at the Grange Hall! Looking for more information? Email Erin Barry. Want to donate kids’ clothes & get new ones? Come by on Saturday morning, 9:30 to 11:30. Nominal fee of $3.00 per family (and no one is turned away)–take all that you need! Time for a “Repair Cafe”? Also at our December meeting, we talked about hosting one of these special events–and members were on board. 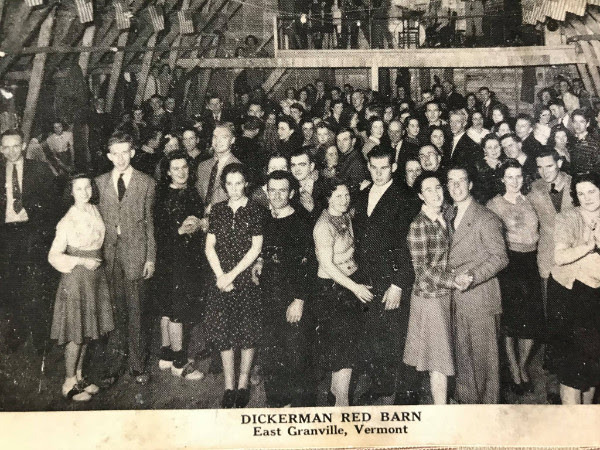 You may have read about these events in VT newspapers, since 2 were held in Central VT in 2018. I was able to take part in one held in Barre, as “fixpert” working on furniture and woodworking repairs–there were others concentrating on appliance repair, smart-phone repairs, sewing repairs, and much more. I really enjoyed helping out with people’s problems, and I know that a lot of people benefited from the various “fixperts” and their varied expertise. I was contacted recently by an organizer from the Central VT Solid Waste Management District, which has the “selfish” motivation of keeping things out of the landfill, and the altruistic one of helping people save money by fixing damaged or worn items, rather than buying new ones. He asked me if I would be interested in taking part in another…and if I knew of a space that could be used. As it happens, I do! No date set yet, but I’ll send out news if we can get one set up. Other refreshments to keep the “fixperts” going? Another end-of-year tradition in which many of us participate is making contributions to our favorite non-profit causes. 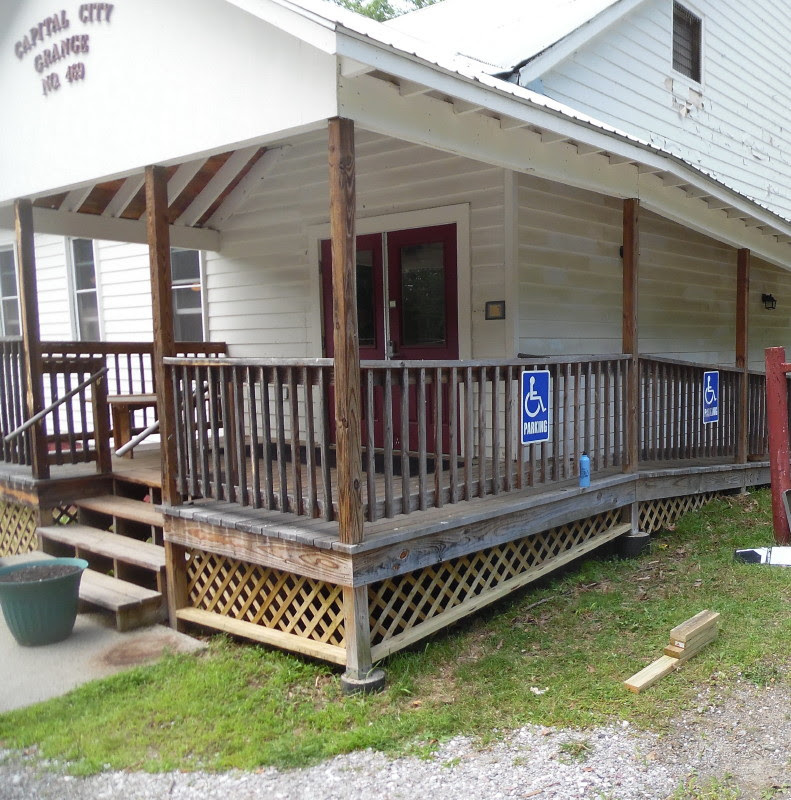 As they did last year, the “Friends of the Capital City Grange Hall” are seeking tax-deductible gifts, that will help further improvement plans for the Hall. It starts with letters mailed out to previous donors, and regular users of the Grange Hall, so many of you who read the Grange Notes may have already been asked. But if you haven’t heard–now is a perfect time for a donation to the FCCGH. A partner organization for the Grange, with 501(c)(3) status, the Friends will put your contribution to work. 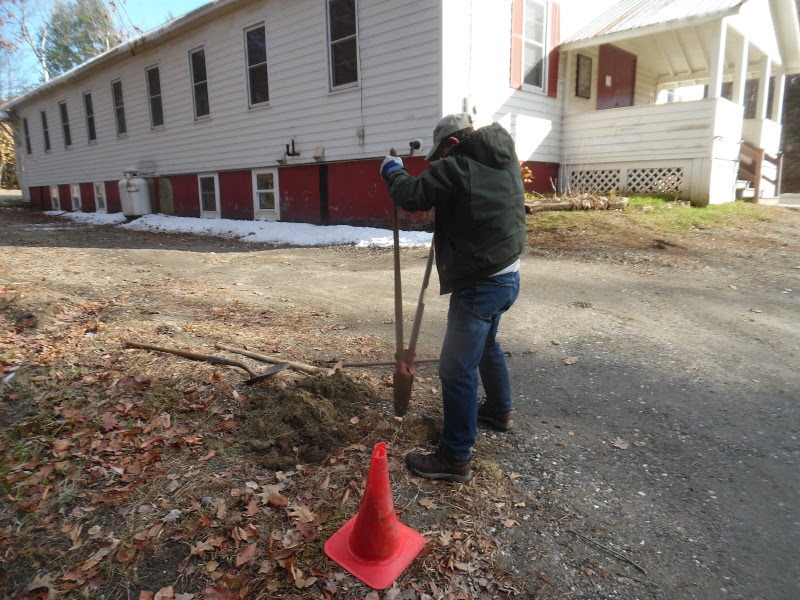 It may help to provide matching funds, to combine with grant money for the next big project on the planning board: “Mess Hall to Dining Hall”. Your contribution could also go to one of the shorter-term projects: installing more ceiling fans in the Main Hall to improve ventilation for large events like dances, and starting experiments with acoustic panels to improve the sound quality of the Hall. Whereever it goes, your contribution will make the Hall an even more attractive, comfortable and useful space for community meetings, celebrations, services, clothing exchanges, dances, rehearsals and much more! All contributions are tax-deductible, to the extent allowable by law. You will receive a receipt, however you donate, for your records. And in yet another year-end tradition: we know that it’s hard to keep track of everything that happens in this holiday season, with special events, special foods to prepare and eat, special songs to sing, family to entertain (or be entertained by), presents to agonize over, buy and wrap and much more. or give it to any Grange officer, or bring it to our next meeting, on Jan. 5th, 2019! If you are joining for the first time, fill out the simple application form on our website: link to form and mail it to the same address. 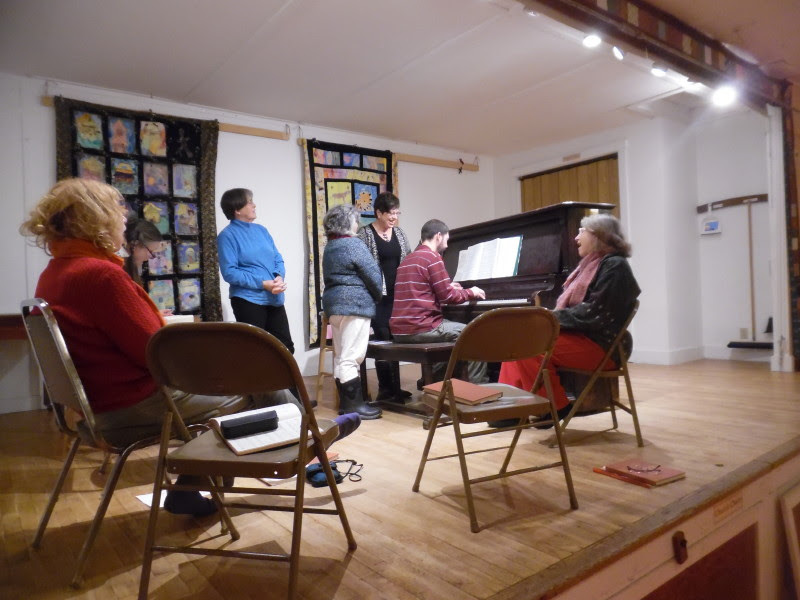 Mid-November Grange report–wintry weather doesn’t stop our Hall being busy! Happy Thanksgiving to all in the Grange community! As we head toward the holiday on Thursday, we are thankful for the many people who keep the Grange and the Hall going, to help us in our community service mission. We hope that the holiday will give us a chance to consider the many helpful people in each of the communities we inhabit, which make life better for all of us. And that all of us have a bountiful Thanksgiving feast to enjoy! Our Grange Hall will be used by a large extended family on Thursday for their holiday meal, FYI! Our monthly meeting, starting at 4:15 to give us time to complete the Grange business part before the “program”. What goes on at a Grange meeting? check out the description on the Grange website. 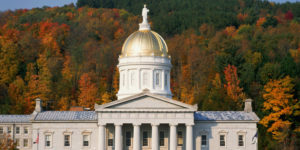 This month, the program will be a presentation on the VT Community Loan Fund. We have chosen to invest some of the savings we have been able to make in the VCLF; we will hear from Jake Ide, the director of Investment and Philanthropy, about the work that the organization does with the money invested in it. He’ll answer questions, and explain how the Loan Fund chooses worthy recipients for loans, and tell about the results which the Fund has seen seen since being founded in 1986. For more info, check the VCLF website. You could invest there too! and for the next Community Potluck, starting about 6:00, we’ll share the tasty dishes brought by participants, and have a chance to chew upon and digest what we have discussed with other people who have come to the meeting, and/or the discussion about the Loan Fund. We’ll be glad to try your special recipes–by then we might even be ready for a bit more turkey, in some form or other. Grange meetings and events are free and open to all, members and non-members, local or visiting from far away. No password required! Have you ever wished you didn’t make that turn? We suspect that applies to one of the people attending the memorial service on Sunday, just before the snowstorm–see the top photo. 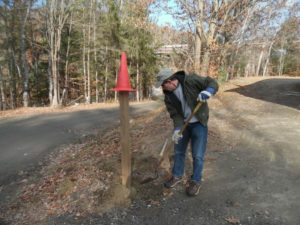 The “hairpin turn” from the lane on the west side, to go down the driveway has led to some problems in the past, and our reflector posts and orange pylons have not stayed in place. With the help of Kurt Giavara and a post-hole tool, we put in a more solid indicator (4×4) for where the turn should happen. We’ll add some reflectors later this week to make it even more visible in the ever-growing night-time hours. Please drive safely in the winter weather, including in the Grange parking lot and the driveway! Despite the first snow of the season, the “pop-up” consignment store set up in the Grange Hall on Oct. 27th attracted over 20 vendor booths, and lots of customers for the higher-end clothing, jewelry and other items being sold. Donations of booth fees to “Circle”, the shelter for abused women in Barre added up to over $200. We look forward to more events like these–we’re glad to facilitate moving unused items to people who can appreciate them, and to the increase of community ties this event can bring. Many new people came to our Hall, and were impressed with the space and its convenient location, so we hope this will lead to more uses by Berlin residents and others. One note about the basement level, which we have plans to insulate and improve–the number of booth requests led to some vendors setting up downstairs. There were complaints about the smell of mildew (which we’ll note in our next grant application for the renovation project)–but sales were still better than expected! Help us fill this year’s Holiday Boxes, at least as full as last year’s! any other tasty foods–you know they will be appreciated! 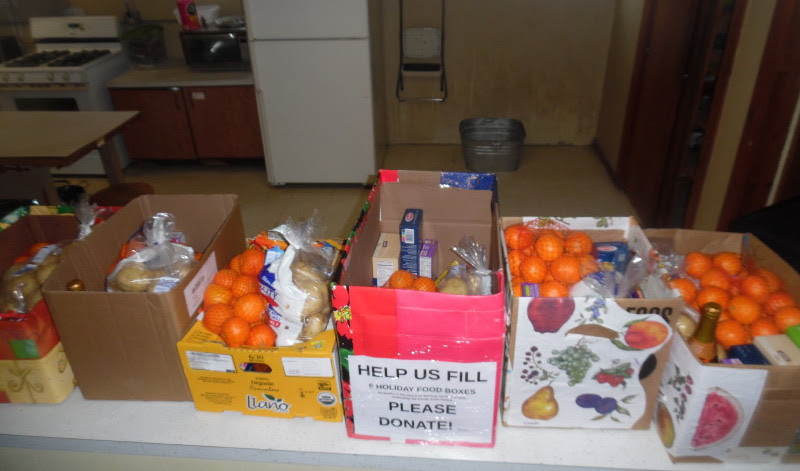 We have already had donations that have let Merry Shernock buy turkeys to be added before we send them off in mid-December, and we’ll use other donations to buy fresh fruits, vegetables, etc. to be added at the last minute. So donations by cash or check will be welcome as well! Drop them off in the specially marked vase which is set out with the donation boxes at the Grange, or give a check to a Grange member, or mail it to the Grange postal address: PO Box 208, Northfield Falls VT 05664. 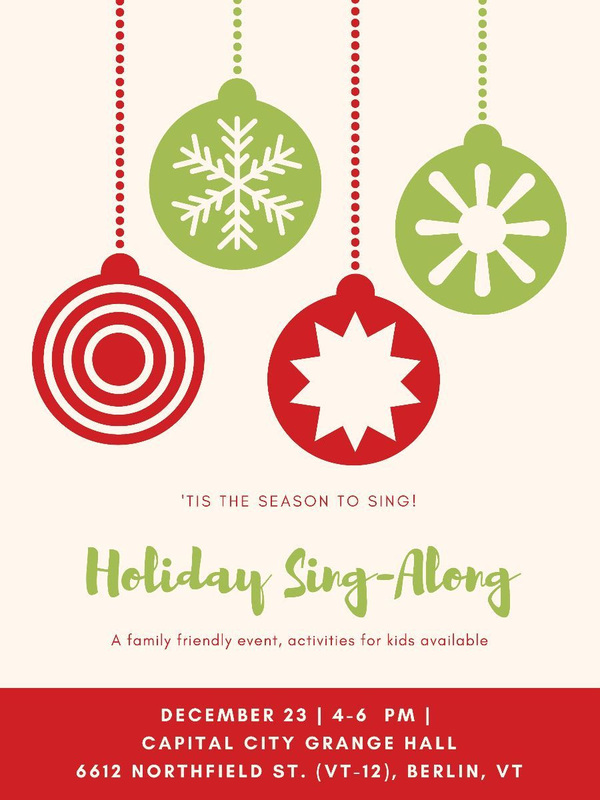 Put the Grange Holiday Sing-Along on your calendar! 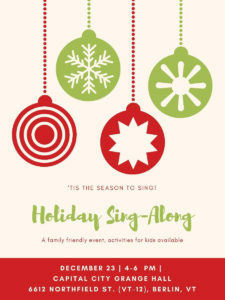 Sunday, Dec. 23rd will mark the 2nd annual get-together, just to sing holiday favorites at the Grange Hall. Mat Nunnelly, our excellent Grange Musician, will accompany songs on the piano. We will do our best to sing along with any seasonal songs you bring, from sacred songs of any tradition to less-than-sacred ditties about the demise of elderly relatives at the hands (or hooves) of seasonal ungulates. We are non-denominational and non-partisan, we just like to sing! Bring song-books or printed lyrics if you have them. Join us from 4:00 to 6:00 PM. We’ll provide some mulled cider–please bring some goodies to share if you can. We’ll also provide some distractions for little ones downstairs–or they can join in the singing! 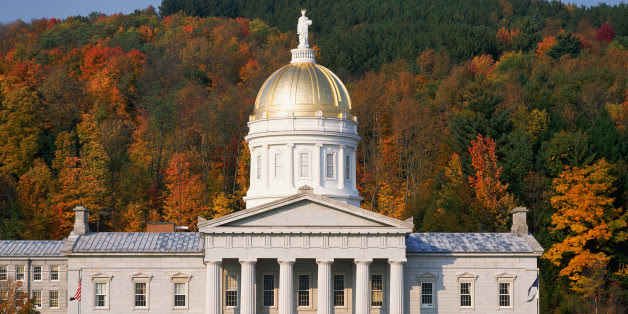 Dedicated readers will remember that the VT State Grange’s annual meeting, known as the “state session” was held on October 19 & 20th. Among the work done at the session was deliberation on the many Resolutions (over 20) submitted to be voted on by the assembled delegates. If passed, they become the official policy of the State Grange. While the Grange is not as large as it once was (there are about 1100 members in 36 Community Granges in VT), it’s still a good talking point with your local select-board, legislators and senators if you can say that a particular position is State Grange policy. The results of the State Session votes are now available on the CCG website: Resolutions with Votes if you want to see how they fared. The topics range from restricting the use to neonicitinoid pesticides (passed), to support for a minimum wage increase to $12.00 per hour (passed), to making marijuana smoking subject to the same limitations as tobacco smoking (rejected, as we were told this is already legislated policy). Check the whole list of resolutions to see more. Also concerning the “upper levels” of the Grange, Vermont hosted the 152nd National Convention at the Stoweflake, from Nov. 14th to 18th. Grange members from across the country got a good dose of VT weather, with the snowstorms of last week, but as far as I know a good time was had by all. VT State Grange officials are probably quite tired after coordinating the tours, hospitality and coffee needed by over 400 visitors! Our Grange loaned some coffee-makers to the event, I helped to relay donated “personal care items” for homeless veterans donated by VT Granges to the Stoweflake, and Marj Power helped to iron costumes fro Grange rituals one afternoon! Eventually, the National Grange will pass on how the Convention voted on State resolutions that affect National policy. All resolutions start at the Community Grange level, so think about what you’d like CCG #469 to submit for next year’s State and National sessions! We know that it’s hard to keep track of everything that happens in this holiday season, with special events, special foods to prepare and eat, special songs to sing, family to entertain (or be entertained by), presents to agonize over, buy and wrap and much more. So–we’ll be sending out a reminder to Grange members and friends soon, letting them know that as of Jan. 1st, it’s time to renew your Capital City Grange membership, or sign up for the first time! I’ll keep sending out Grange Notes to all of you regardless of your membership status–but it really helps us to be an active Community Grange if you join us. Help us provide community service that makes a difference, and respond when you get the membership email soon! Then you won’t have to remember when January rolls around. In case you heard me announce it at the Sept. 29th contra dance–we had originally hoped to do a Hall cleaning party before the Oct. 6th Grange meeting, but we’ll have to re-schedule that–there is a “Intensive Youth Musical Theater Workshop” happening, from 8:00 AM to 4:00 PM. We’ll send out a new schedule as soon as possible. Elections of officers: every 2 years, we must hold Grange elections. We’d love to have some more candidates, some of us old war-horses are getting pretty creaky! We’ll happily train you! Discussion of resolutions: the State Grange meeting on Oct. 18 & 19 will consider proposed resolutions from Community Granges like ours. They range from calling for more regulation of neo-nicitinoid pesticides, to changing the day of town meetings, state and national elections to Saturday, to supporting the Equal Rights Amendment, to eliminating Daylight Savings Time–and many more. You can see more info, and download all the Resolutions at the CCG website: 2018 vt state grange proposed resolutions Let us know what you think! I’ll have a number of printed copies for the meeting. Continued discussion of how to better define the “mission” of our Grange–besides maintaining and improving the Hall, how can we best involve more people in the Grange and do more community service? After this meeting, we provide a chance to meet the local candidates; we’ve been sponsoring cooking classes, which have been very popular–are there other new things we could do? We’d welcome your suggestions! The other reason that we want to start a bit early is that we want to have time to Meet the State Rep Candidates. Now that we are back to 1st Saturday meetings for the fall, winter and spring, you can put on your calendar the regular schedule of 1st Saturday potlucks, starting about 6:00. This month’s dinner will have special guests, as noted above, but like all of them, it will also feature tasty dishes brought in by our Grange members and friends. We usually have everything from chips to casseroles, salads to sweet treats. It’s a delicious way to socialize, and to get to know your neighbors–and your State Rep candidates this time! 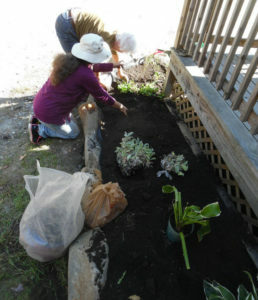 This group of volunteers is pretty much the same as the one which put in the first set of flower-beds in 2017–with a new Community Service Volunteer. 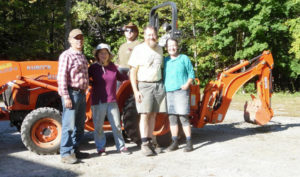 The bottom right picture shows the crew with the extremely helpful Kubota, which helped us place the rocks. From left to right: Gerold & Carol, Ryk, Tim & Merry enjoy the late afternoon sun and a job well done. 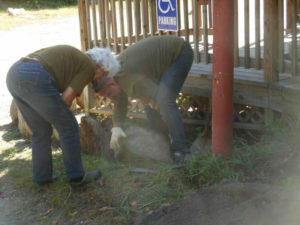 Elizabeth had to leave before the photo, but was also a stalwart worker. We also want to thank Ann Pearce & Carol Noyes for donating plants, and also Berlin neighbor Gale who brought over some daylilies, and offered good suggestions on the old entrance flower beds. 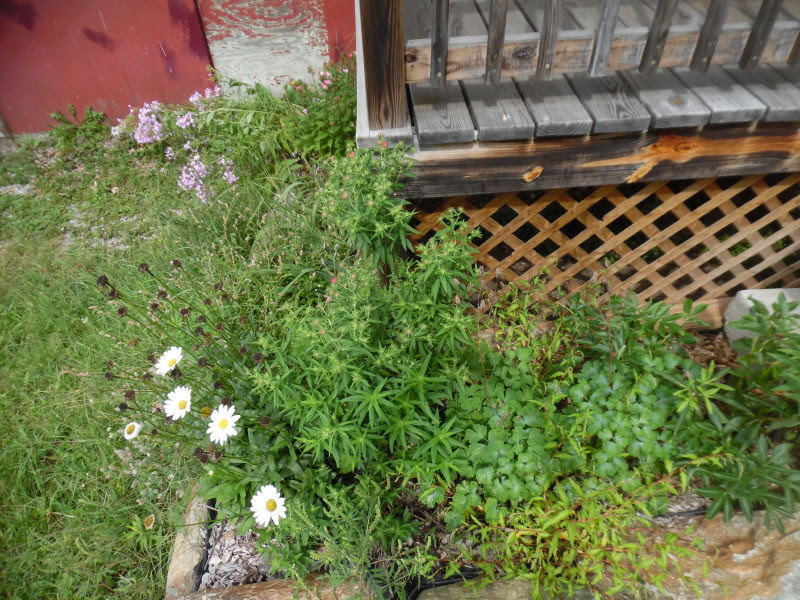 We’d like to recruit some more help to keep the flowers weeded and watered next year–we have an outside faucet now which will make the watering much easier! 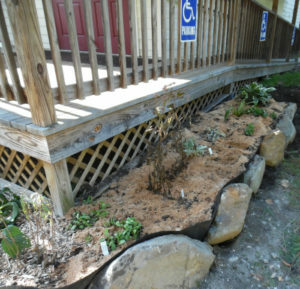 And there is much more that could be done to improve the old flower beds by the original “dancers'” entrance, add plantings to other areas, etc. Please contact Merry Shernock (rentals@capitalcitygrange.org) or Tim Swartz (swartztim15@gmail.com) if you’re interested. 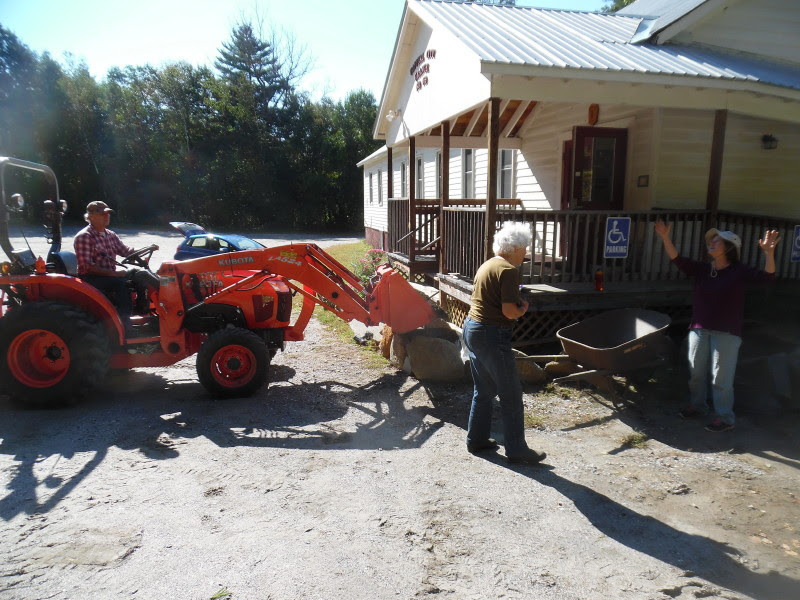 You can do this on your own schedule, and help to improve our Grange Hall’s appearance! 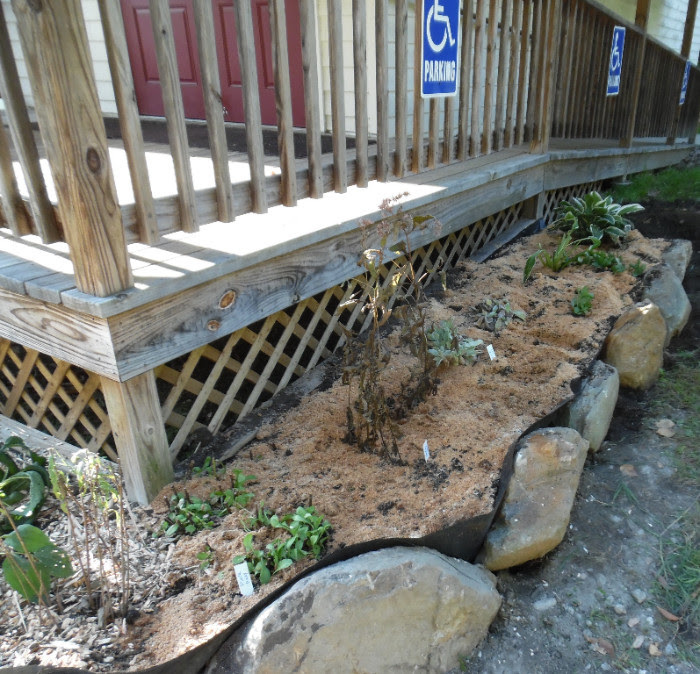 In the last Grange Notes, I incorrectly said that the flower bed project would be on Saturday–please come on Sunday, Sept. 23rd from 1:00 to 5:00 to help us move rocks, shovel soil & plant perennials on the remaining sides of the entrance porch. 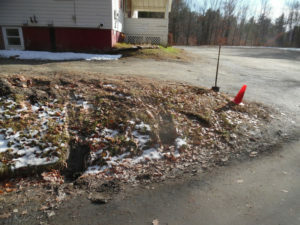 In the to picture below, see the first new planting bed, full of late-summer greenery & flowers. We could use some help weeding this bed as well! Below that, see the other corner–doesn’t it look naked? A few more rocks and a little time will make it look good! 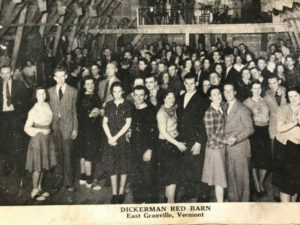 Debby Ploof of the State Grange, who organized the Fall Festival sent me a better photo, showing the range of Grangers who enjoyed the dancing. I couldn’t resist! Grange Meetings for the Fall began on Sept. 15th. “Mission” is on our minds. We had a chance to do a “summer catch-up”, reviewing all the work that has been done on the plumbing, the septic tank pumping, and the driveway re-work. We gave the expenditures a formal approval to supplement the email discussion. We also decided on a formal limit to the amount that can be spent between Grange meetings, with authorization from the President, the Vice President, or the Executive Committee: $250. We also had a good discussion of ways to make our meetings more interesting–which quickly morphed into a discussion of how to attract more people to get involved in the Grange. This in turn moved us to begin a discussion of the mission of our Grange. 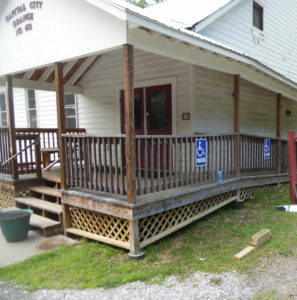 Besides maintaining a community Hall, how can we broaden our community service? What sort of projects would the people already familiar with the Hall like to get involved in–and what other types of people could we seek to serve with new projects? This is only the beginning of a longer discussion, I’m sure. We would welcome input from those who read these Grange notes–send an email to: swartztim15@gmail.com and we’ll add them to the list. Even better, please join us at our next meeting: Oct. 6th, at 4:30 PM. Our October meeting will also include our every-two-years elections for Grange Officers–which brings up the point that a lot of us who are officers are, for some reason, getting older every year! We’d love to have some new, energetic faces join us, as active members and as the officers who work to chart the course for our organization. Much support is available–as long as we last, at least! Also on the agenda: discussion of the Resolutions to be voted on at the VT State Grange annual session, Oct. 19 & 20. These will cover all sorts of areas–agricultural, state government, environmental & Grange-related. I’ll send out PDF copies, or a link to them on the VT State Grange website as soon as I get them from the State. Current incumbent Rep. Anne Donahue will be unable to attend–at a family reunion. Kenneth Goslant has not yet replied–we’ll keep you posted! These candidates will join us for our Community Potluck, starting at 6:00, so you’ll have a chance to speak with them in a relaxed fashion–and see what they like to eat, also! 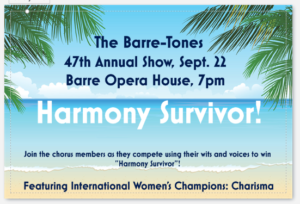 The Barretones have been making beautiful barbershop music in Central VT since 1969. 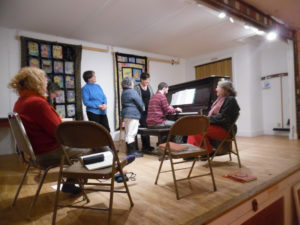 Beginning a few years ago, they have rented our Hall on Monday evenings for rehearsals. 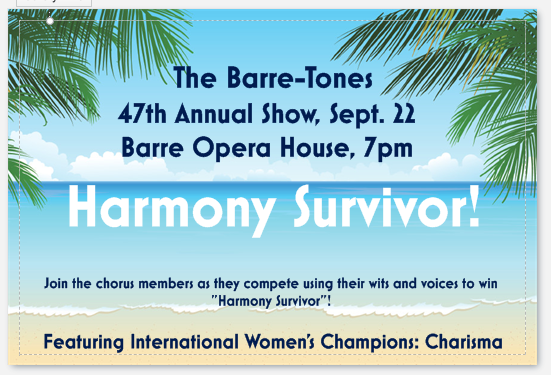 Check them out at their annual concert, this coming weekend.